Our director at Swoop Digital, Carol Poole, has been invited to run a workshop at the 2nd Annual Digital Engagement in VET which will be held at the Crowne Plaza, Melbourne, on 24th November 2016. Carol is recognised in the industry as an expert who has effectively used data to drive highly successful campaigns for her clients. Titled ‘Developing a Data-Driven Social Media Strategy’, this workshop presents a great opportunity for those in the VET industry to understand how they can effectively engage and retain their target audience, getting value for every dollar spent. Most businesses have some sort of a social media strategy, but often they struggle with engagement and falling returns on their investment. This workshop will give you a chance to review your current strategy, audience and theme, inform you of tools of data analytics and help you to create an innovate strategy that works for your business. An important takeaway from this workshop will also be the big picture – never losing track of the customer journey. 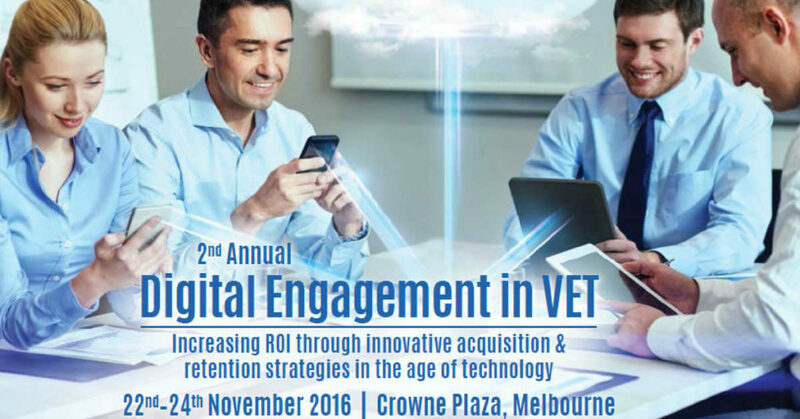 The 2nd Annual Digital Engagement in VET will be hosted over 3 days, 22nd-24th November, 2016 and will feature some wonderful speakers and panellists. All of them are VET industry experts who have worked with leading educational institutions in the public and private sector for many years. This is a great opportunity to hear about their experiences, network with other industry professionals, and learn new strategies.